Emerald Waterways, known as Evergreen Cruises & Tours in Australia, launched in 2014 as a division of Scenic, a company that offers everything from land tours to luxury river cruises. 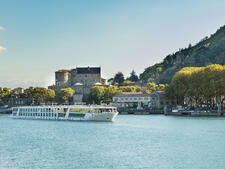 The line made quite a statement with its first three European river cruise ships in 2014 and launched two more ships in 2015, then three more in 2017. 2018 brought its most recent ship to its fleet, Emerald Harmony, which was designed to sail into the center of Ho Chi Minh City. In 2019 it will charter a yacht in Croatia and debut a new ship on the Mekong River; 2020 will bring two yachts total to Croatia. 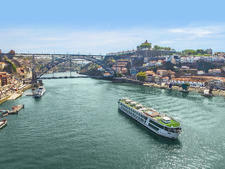 Emerald/Evergreen also specializes in combination itineraries by adding river cruises to land tours in Egypt, Africa, South America, Canada and Alaska, as well as offering a new option linking Danube and Russian river cruises. Overall, Emerald Waterways/Evergreen has significantly raised the bar within the "cheap and cheerful" river cruise market. The line aims to compete with four-star brands like Viking Cruises and Avalon Waterways by boasting a handful of innovative design touches and less expensive fares that still include a lot within the price of the cruise. Included in the fare are drinks (soft and alcoholic) at lunch and dinner, shore excursions in every port (including one 'gentle walkers' tour), transfers and tips. Emerald's main marketing push is with English-speaking clients, with about half hailing from Australia. The most innovative aspect of design for the Emerald Waterways/Evergreen Cruises fleet is a dual-purpose area at the aft of the ship that transforms from an indoor, heated pool with retractable roof during the day, to a cinema at night. Other vessels such as Uniworld's S.S. Antoinette offer separate pool and cinema facilities, but Emerald Waterways' reconfigurable room is a unique-to-river feature. A second impressive state-of-the-art feature is the balcony cabins that transform into conservatories at the touch of a button. The rest of the ships' innovations have become fairly standard on newly built river ships, including good-sized suites, balconies in some of the cabins and an open-air alternative dining space (for breakfast and lunch only). As is the case with many river cruise lines, Emerald Waterways/Evergreen includes quite a lot within the cost to the overall cruise fare. Shore excursions and transfers are included, although in-depth or unusual shore excursions levy a fee. Coffee, tea and water, as well as wine, spirits and beer with lunch and dinner are included. 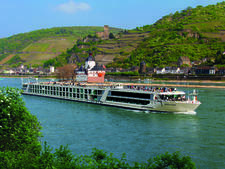 Emerald Waterways/Evergreen Cruises serves the typical European river cruise passenger -- generally well-traveled cruise veterans in the 55-plus bracket. Half of the passengers come from the U.K., with the rest coming from Australia, New Zealand, United States and Canada. The Emerald Waterways fleet is increasing to eight in 2019, along with several charters. Five are 182-passenger, 443-foot long ships, while two are smaller. Emerald Liberte carries 138 passengers, while Emerald Radiance has 112. 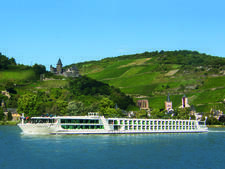 The five 182-passenger vessels are essentially identical to each other and sail seven- to 14-night itineraries on the Rhine, Main, Danube and Mosel rivers. 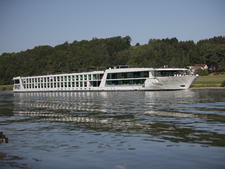 The two smaller ships sail on rivers in France and Portugal and are boutique versions of the larger ships. The main difference, other than size, is that Emerald Radiance has the pool on the roof and it doesn't convert into a cinema at night. In 2019, Emerald Waterways will debut Emerald Harmony on the Mekong (the company formerly chartered the Mekong Navigator there). Emerald Harmony will be notable for being able to sail up to Ho Chi Minh City (Saigon); not all ships are built to go into the city. 2019 also marks Emerald Waterways' ocean cruising debut, with small ship cruising on Croatia's Dalmatian Coast. In its first year, Emerald Waterways will charter Adriatic Princess II. In 2020, the line will have two small ships there: ms Swallow and MS Lastavica. Each of those yachts carry 36 passengers.